Dinesh Trivedi resigned today as Railway Minister ending his defiance and bringing to a close five-day drama after he incurred the wrath of Trinamool Congress for hiking passenger fares in the Railway Budget. Two Italian tourists were abducted in the tribal-dominated Ganjam district of Odisha by Maoists demanding an immediate end to anti-Naxal operations and release of some jailed colleagues. In growing instances of corruption singeing the country�s bureaucracy, searches by Maharashtra�s Anti-Corruption Bureau sleuths on the premises of bureaucrat Nitesh Janardhan Thakur have yielded properties and cash worth Rs 200 crore so far. The political crisis in the Uttarakhand Congress refused to die down with sulking Union Minister Harish Rawat today saying he had not received any �concrete� proposal from the Central leadership to end the stalemate. After the Assembly poll debacle, the Congress today took the first step towards revamping its Punjab unit by deciding to appoint Abohar MLA Sunil Jakhar as its legislature party leader. An official announcement in this regard will be made by Gulchain Singh Charakh tomorrow. 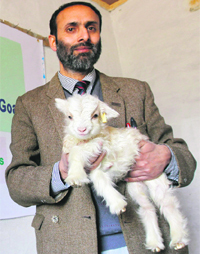 The buzz around Noorie has continued to grow since March 9 when scientists at the Sher-e-Kashmir University of Agricultural Sciences & Technology (SKUAST) announced the successful cloning of the world�s first Pashmina goat, a rare and dwindling breed found in the upper reaches of Ladakh and Tibet.